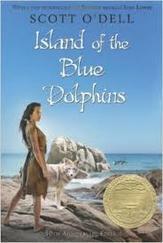 Island of the Blue Dolphins is the story of a young girl stranded for years on an island off the California coast. It is based on the true story of Juana María, a Nicoleña Indian, left alone for 18 years on San Nicolas Island in the 19th century. Explore San Miguel Island, Karana's village, and sea life then report your information to Father Rubio at Mission Santa Barbara to receive your reward certificate. Click on the letter to the left to get started!